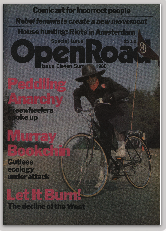 Open Road differentiated itself from the mainstream and “sectarian leftists organs” in that its reportage sought to convey “anti-authoritarian trends and developments wherever they may occur, and to push no organization other than those which are created and sustained by ordinary people in the heat of struggle.” (Issue 2, page 3). 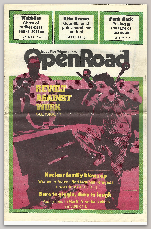 The Open Road collective formed in Vancouver in late 1975 to produce an international forum for all those dedicated to a totalistic human liberation. 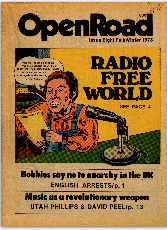 The New Left of the late 1960s and early '70s was overwhelmingly dominated by Marxism-Leninism, but it also contained an anarchistic current. 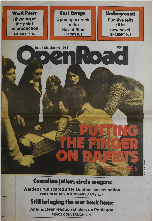 This was manifested — among many feminists, countercultural activists, student radicals and others — in a deep commitment to non-hierarchical collective organizational forms. 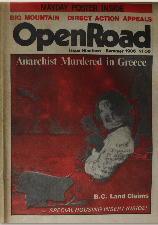 It didn't much matter to our OR collective whether the groups and individuals active in this current called themselves anarchists or libertarian socialists or anti-authoritarians or, as likely at the time, no label at all. 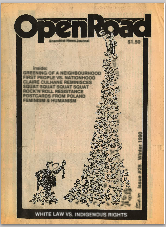 What mattered was that they, like us, believed in a sweeping personal, social, economic freedom that went far beyond anything being offered by the authoritarian left. 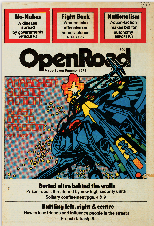 The idea behind The Open Road was to place all of this anti-authoritarian activity, regardless of specific labels or tactics, side by side in a single publication. By doing so, we thought those involved in these varied activities in diverse places might just begin to see how much they shared in common — together they were the nucleus for a resurgent anarchist movement. Once No. 1 was completed we did a mass mailing, then waited anxiously for the response. (Much of this mail-out was made possible by friends at the New York-based newspaper Yipster Times, who gave us their substantial mailing list.) The letters came pouring in. One from an Alabama activist, Michael Littlefarb, was typical: "I can't remember the last time I got so excited. 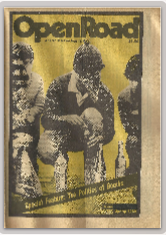 … spoke to me at a deeper level than anything I have seen since the Sixties." Buoyed by the gratifying response, we moved on to issue No. 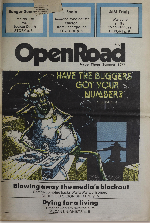 2 and 3 and… The original collective would produce The Open Road for its first few years, then other collectives would continue until it finally ceased publication in 1990. 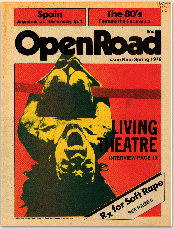 Open Road has thankfully reemerged into the public life of the present. 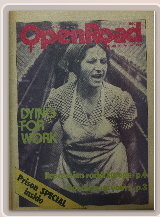 Through its digitization, a new audience of readers can explore one of the most important and influential English-language anarchist periodicals of the late twentieth century. 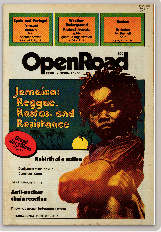 For those of us who were not active within the radical communities of the 1970s and 1980s, the paper’s existence can give us insight into not only the activist past, but also the present. 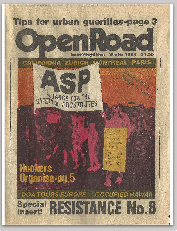 As David Spaner’s comments illustrate, the origins of Open Road offer us a pathway in to the politically transformative years of the 1970s, and beyond. 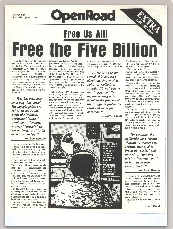 In an immediate sense, the existence of the paper can draw our attention towards a global shift that took place within political and cultural character of the New Left. 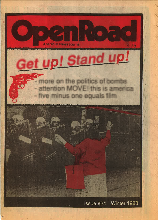 Like other activists at the time, the Open Road collective was deeply motivated by the New Left’s militancy and its emphasis on community organizing, anti-capitalism, and anti-imperialism, as well as its quest for social and personal liberation. Nevertheless, as Spanner notes, the political and cultural influence of Marxism-Leninism was also limiting for some activists. 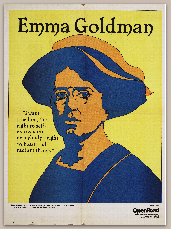 As a result, these radicals turned to anarchism as an alternate form of revolutionary socialism. 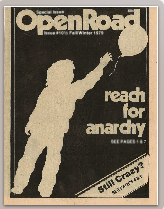 In this search, anarchists in the 1970s were part of a much older pattern of leftist organizing that had sought to develop alternatives to state socialism since the 19th century. 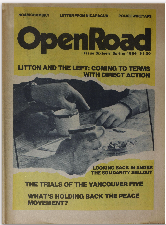 In Vancouver, as in many other places, these political and cultural motivations produced a resurging pattern of anarchist activism beginning in the 1960s and 1970s. 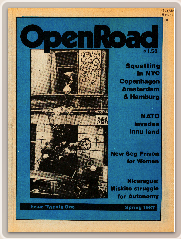 Locally, the publishing of Open Road helped to catalyze the promotion of new anarchist projects, including reading groups, agitprop initiatives, periodicals, and collectives that sought to bring anarchist politics into direct conversation with the broader radical traditions of the time. But these transformations were also global. 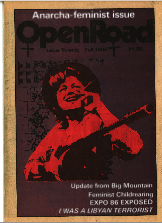 If you turn to the pages of Open Road, you will see the geographical diversity of this resurgence in the form of published letters that were sent to the collective from anarchists around the world. 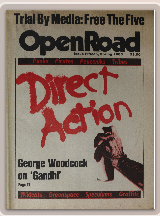 In this sense, anarchist politics contributed significantly to the transformation of social movement activism in the decades after the 1960s, both in Vancouver and elsewhere. 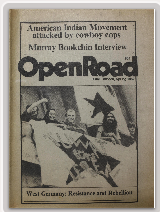 This history is particularly relevant because of the strong connections that continue to link the post-1960s and the present. 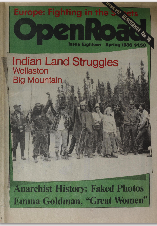 In the span of time between then and now, anarchist politics, culture, and activism have gone through many changes. 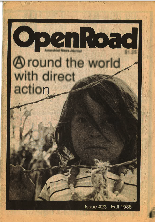 Nevertheless, if you were to flip through the pages of Open Road you would find a diverse body of opinion on great number of familiar topics: indigenous struggles, gender and sexuality, anti-militarism, technology and the surveillance state, feminism, armed struggle, the politics of organization, environmental activism, workplace struggles and the labour movement, anti-imperialism, popular culture, prison abolition, and many other issues. The interpretation of these issues might seem deeply familiar. They might also seem different in ways that are inspiring, perplexing, infuriating, or downright disturbing. 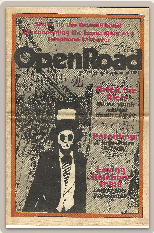 But regardless of whether we see in Open Road continuities with who we are now, or confirmations of what we are not, the very act of exploring will hopefully provide a sense of perspective to those of us who find value in understanding our own identities in relation to those who came before us. 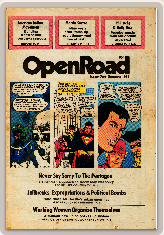 Earth & Fire - In 1972, before there was an Open Road, some folks in Vancouver published Earth & Fire - Here are Issue #1 (April 1972) and Issue #2 (Summer 1972). Large file sizes may take a while to display/download!